Attendees of the Oregon Student Nurses Association Convention held at Linfield College in Portland, Oregon learned a great deal about the Office of the National Nurse initiative, including why this Office is necessary and the proposed recommendations of how it would function. The current proposal asks for a re-titling of the Chief Nurse Officer of the US Public Health Service to become the National Nurse. Renaming an existing position is an expedient, cost effective way to help signify this position’s focus is on the nation’s health and that promotion to be on a national level. The Office of the National Nurse will function in a complementary role with the Office of the Surgeon General and other current agenices providing health care services. The Office of the National Nurse will work to promote and improve health literacy. People with low health literacy are more likely to report poor health and are at greater risk for hospitalization. Research shows patient education improves adherence and increases cooperation with therapeutic regimens. Under the ONN proposal, the Office of the National Nurse will also call on nurses, nursing students, and retirees to join with the Medical Reserve Corps, parish nurses, and other local community agencies such as the AARP to organize and deliver national health priority educational activities to promote and enhance the health of individuals in their communities. "The trend in health care today is to focus the responsibility for health status on the patient. In order to accomplish this, patients need education. Doctors don’t have the time or resources to adequately educate patients. And most of the time doctor’s don’t have nurses anymore for economic reasons. Many times health care providers seem like professors of quantum physics who stand at the blackboard writing an endless equation at the speed of light while expecting their patients to follow along. The patient is much like many of those students who were lost before the end of the first sentence and too embarrassed or intimidated to let on. And so we have the patient who thinks it’s perfectly OK to season her foods with chopped up bacon because she can no longer use salt! Or the patient who took his lanoxin like nitroglycerin (three or four at a time for 3 days until he was toxic and almost dead) because his friend told him those “little white pills” are for heart pains. A primary role of the nurse is to educate patients, and with an Office of the National Nurse, nurses would be even more accessible to the public. Patient education and prevention of costly illnesses would take precedence. Nurses are considered among the most ethical and honest professionals. Patients trust nurses. Let’s take full advantage of that fact and promote improved outcomes and wellness. We could begin to heal the health crisis in this country!" A great way to help hospitals in need of nurses, while making great money is to be a traveling nurse. I have been a traveling to places I have always wanted to go for the past 7 years. I love every minute of it. I have also found that I feel good about going to places that need nurses. 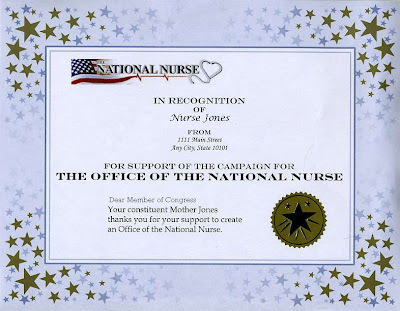 The National Nursing Network Organization is completely volunteer and made up of grassroots supporters such as yourselves. Many organizations and campaigns hire government relation specialists who are paid to go to Congress and advocate on their behalf. These same groups often pay a stipend or honorarium to their Board of Directors. This is not the case with the National Nursing Network Organization. We believe this campaign is for those of us who live on Main Street, not K Street. Members of the NNNO Board of Directors value the power each American has to participate and make a difference in improving the health of our country. All three of our elected nurses in Congress began with nursing careers, and all three have made a huge difference in helping to improve the lives of nurses and ordinary Americans. It is our goal to do the same. This campaign depends on you-and today we ask you, our supporters, to please make an on line donation or email Teri to learn where to send a check. We are asking for $20. For those who contribute $20, the team will place a certificate in your honor inside a packet that will be delivered to your US Representative during our March trip to Washington DC. The same certificate will also be mailed to you. Please know that it costs $20 to make up a professional packet of supporting materials about the Office of the National Nurse proposal, so your donation is actually paying for this packet. Last year, with the generous contributions we received, we were able to deliver dozens of packets about the Office of the National Nurse initiative to members of Congress. The certificates will be different than those sent out in 2007. We wish to thank those of you who have already made a contribution. Since Friday's newsletter, we have received donations from supporters living in Arizona, California, Florida, Georgia, Illinois, Maryland, Massachusetts, Minnesota, Nevada, New York, North Carolina, North Dakota, Oregon, Pennsylvania, Vermont, Virginia, and Washington. Please join us and add your voice to the Campaign for the National Nurse. You have the power to make the Office of the National Nurse become a reality. 3. National Nurse "A National Nurse has been proposed, but not implemented. The Office of the National Nurse would complement the Surgeon General, offering a patient-centric focus on healthcare for the nation. A National Nurse’s job would bring a healthy dose of preventive medicine, easing the burden on America’s health care system and in turn, nurses. Specifically, the National Nurse is proposed to make health care education focused on prevention available to Americans in a very accessible way." 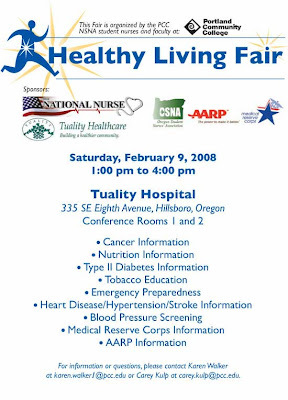 On February 9, 2008 volunteers from Portland Community College's nursing program, the Oregon Student Nurses Association, AARP, Medical Reserve Corps, and Tuality Health Care parish nurse Sandy Madsen joined together to deliver messages of prevention in a Healthy Living Fair that took place at Tuality Community Hospital in Hillsboro, Oregon. Nursing students provided information in English and Spanish utilizing principles of health literacy. Motivational interviewing helped to empower participants to make choices to lead healthier lives and left with an action plan to help them reach their goal. 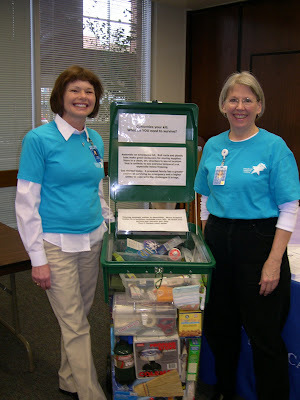 The Medical Reserve Corps volunteers provided emergency preparedness information as well education about the importance of childhood immunizations. 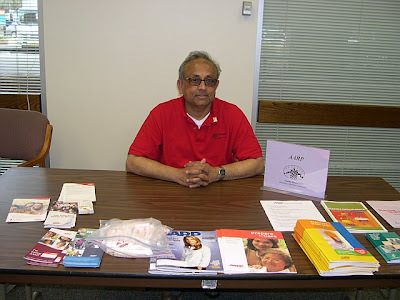 Also present at the Healthy Living Fair was Nitu Iyer, representing the AARP. Many stopped by his table and expressed interest in becoming future members. Health care consumers of all age groups came to the fair. 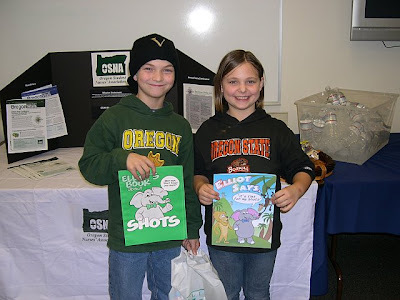 The brother and sister pictured above were particularly interested in learning more about diabetes and also in having their blood pressures checked. Community resources for follow up were provided when indicated. Student nurses from University of Portland's accelerated Master of Nursing program stopped by as well; two of them are in the midst of a public health course and wished to gather information on how this program could be replicated in another community at a future date. Evaluation forms were completed and the results were overwhelming positive. All who came stated they learned new information and many felt that they would be able to attain a healthy living goal in their lives. This program is exactly what the National Nursing Network Organization is advocating for-promoting prevention and wellness in communities across the nation utilizing the MRC, retirees, parish nurses, student nurses, and other health care professionals under the leadership and guidance of an Office of the National Nurse. … because nurses, like other professions, need leadership that will set the standard for best practices in healthcare with a patient-centered focus. A National Nurse would give voice to the concerns of our country’s nurses. Today’s nurses are making more decisions and are taking greater responsibility in educating patients on healthy lifestyles and disease prevention. They need a spokesperson on a national level to voice their concerns about our healthcare system and how to improve it to best serve all patients. A National Nurse would advance our country’s nurses in their pursuit of continued competent, compassionate, patient care and provide a network for them to unite on a national level toward a healthier United States of America. Let your voice count, sign the petition calling for an Office of the National Nurse. 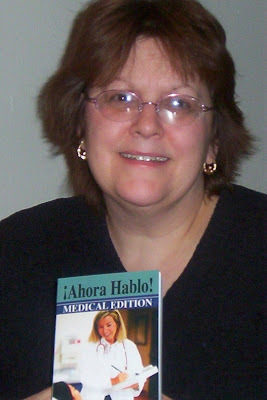 Congratulations Meg for being recently recognized in the Washington Post article Medically Speaking Spanish ! I am writing in support of the important legislation you have authored as HR 4903, the National Nurse Act, which focuses attention on the critical importance of nursing, encourages young people to consider entering nursing careers, and recognizes the need to enhance the value of practicing nurses today. As you know, the NIGH is further engaged in interdisciplinary dialogues for partnership and collaboration with nurses, midwives, related professionals and allied health care providers and other concerned citizens throughout the world. With focus on connection rather than specialization, NIGH is building a diverse and committed global network to implement the Nightingale Declaration Campaign and its objectives for the UN Decade, which are to unite, educate, support, and collaborate with nurses, midwives, related professionals and allied health care providers and concerned citizens toward the goal of achieving a healthy world by 2020; and highlight the significance of nursing, midwifery and associated health services as critical components in all areas addressing global health. We would ask your support of this initiative, as well. We work with approximately 12,000 parish nurses around the United States, located in each of the 50 states, and they would greatly appreciate a national effort to recognize the importance of nursing in this way. We also work with parish nursing organizations in a wide variety of countries, several of which have an Office of the National Nurse, which they have found raises the professional visibility of nursing. If the legislation you have proposed passes, and the Office for the National Nurse is established, it will help to prioritize and deliver the health agenda to the nation by complementing government services already in place, and will focus much needed attention to a health agenda that prioritizes wellness and prevention. We strongly support this legislation.